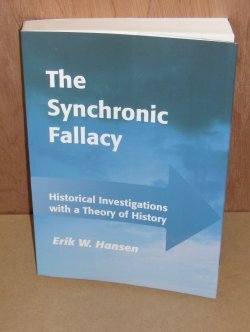 The Synchronic Fallacy introduces a postmodern attitude into the science of language. In accordance with its own Critico-Philological Method the essay is a constructive critique of the transcendent foundationalism of modern synchronic linguistics. Without falling into nihilistic pitfalls of the postmodern mind's antifoundationalism, the author demonstrates both how the static essentialism of modern linguistics turns out to be a transcendent, metaphysical statement of only a section of the everyday language, and how the synchronicity of modern linguistics cannot deliver on its promises to produce empirically relevant and non-shortening descriptions of the dynamic existence of the everyday language. Rehabilitating the Erkenntnisswert of the non-transcendent use of the everyday language - a project with Glossematic, 'Hermeneutical' and 'Deconstructivist' overtones - the Synchronic Fallacy presents an argument against the modern synchronization of historical linguistics and demonstrates the possibility of constructing a historical theory through the introduction of the Existential Function of the everyday language as an implementation of man's temporally structured mind, our historical sense. The essay's critical analyses of the four conceptual pillars of modern, static linguistics -system, structure, state, synchrony - evolve a determination of the temporal-dynamic nature of structure/Structuralism so that the essay's view of our tradition's purported antinomy: 'structure and history', dovetails with the advanced view of language: language change is not to be seen or observed, but comprehended.